GRAND RAPIDS, Mich. - An area of low pressure could create a messy morning commute on Friday, Dec. 14, for parts of West Michigan. Rain, freezing rain and even some snow are all possible beginning late Thursday night. A large slug of moisture will surge into West Michigan Thursday night. There is enough cold air in place initially that the precipitation could fall as freezing rain, or even light snow. Eventually, the warmer air will arrive, switching all of the precipitation back to rain. However, before this happens, up to a tenth of an inch of freezing drizzle could fall. Grand Rapids, Muskegon and Holland southward should be mostly rain. However, north of I-96 and inland of Lake Michigan is a different story. Some forecast models are indicating nearly a tenth of an inch of freezing rain is possible by Friday morning. The temperatures just above the surface will dicate whether this falls as freezing rain or light snow. The silver lining in all of this is that the system will be a quick hitter. Precipitation totals will generally remain under a tenth of an inch. Keep in mind, it doesn't take much freezing drizzle to create some big problems. The storm departs West Michigan by midday Friday. Temperatures will climb well above freezing by the afternoon. Have a photo to share? We’d love to share it with everyone! 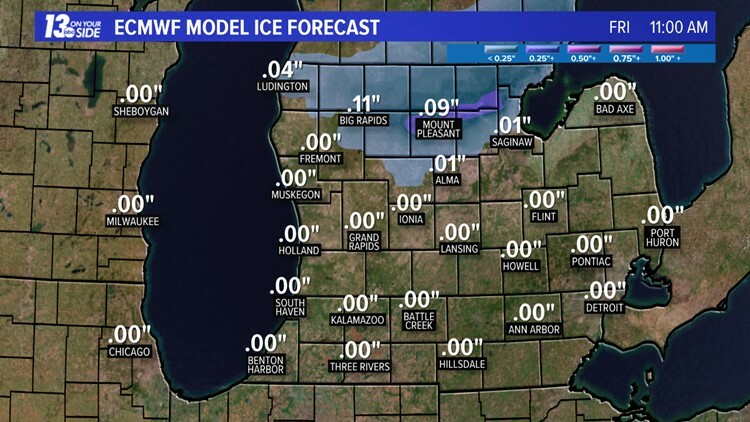 Email your image to weather@wzzm13.com or post it to our Facebook page.